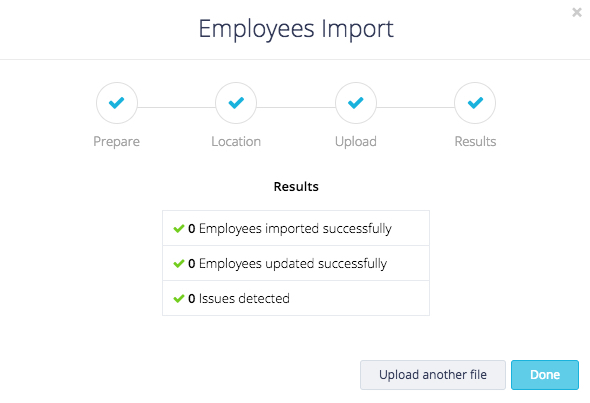 It is easy to import multiple employees' with SwipedOn using the 'Add in Bulk' option. Click on the 'Add Employee' button located at the top-right corner. Click the 'Add in Bulk' option. 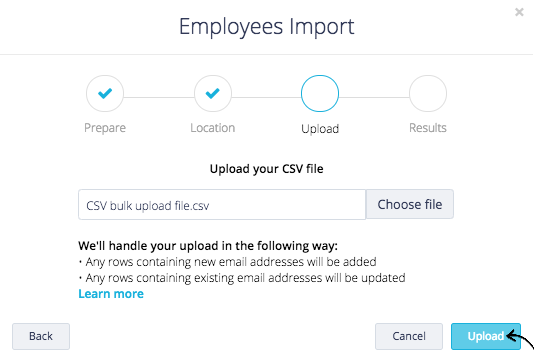 An 'Employees Import' screen will then appear, click on the 'Download CSV Template' button to receive a template to bulk upload employees with. Input the employee information into each relevant column, then continue following the below steps. *Please note, all employees will require a unique email address to be added against their name to successfully upload. Return to the admin portal, and click 'Next' on the pop-up box. If applicable, choose the location you wish to upload your employees to. Otherwise, click 'Next'. 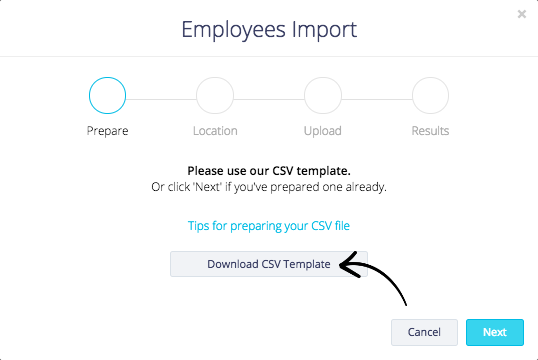 Click 'Choose file' and select the saved CSV file that contains the employee details. Then click 'Upload' and wait a few moments for the CSV file to upload and process. If no issues are detected, you have successfully uploaded your bulk employee list, the employees will now appear in alphabetical order under the 'Employees' tab. Click on the 'Download issues' button. Open the issues file in Excel or alternative spreadsheet software. 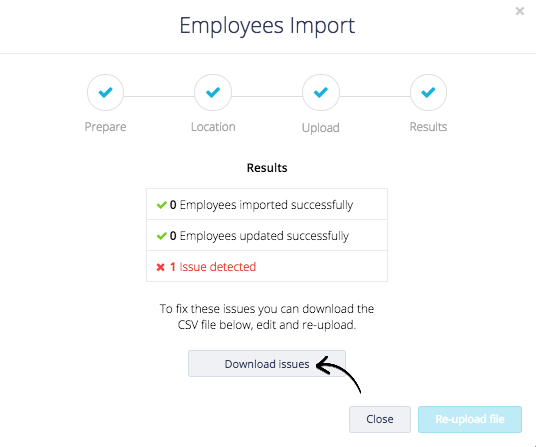 To the right of the employees details within the CSV file, will show a column '*Reason for failure' with the reason that the employee could not be successfully uploaded to your account. Amend the cells that need correcting and save the amended CSV file. Return to the admin portal, and click on the 'Re-upload file' button. Click 'Choose file' and select the updated CSV file. Click on 'Upload' and wait for the file to show it has now successfully uploaded those employees. *Please note, SwipedOn detects new/unique email addresses, and recognises it as a new employee and adds them to your employee list. When adding mobile phone numbers in bulk to employees, ensure the country code is entered at the beginning of the phone number e.g. +1 or 1 are accepted. Invalid mobile number will be denied.